So I decided to start building my own yurt. I've been thinking about buying one for a while, for long term camping. Maybe one day I would live in one, but not yet. Many of the modern yurts made in America are meant to be permanent structures, although they were originally built and designed by nomadic people, like the Mongolians, and meant to be moved around a couple of times a year. Pacific Yurts is a large company that makes modern yurts, but they are expensive and heavy. The smallest one they make (12ft diameter) is close to 900 lbs! And it costs about $5000, just for the base model. There is another company, GoYurt, which makes a small lightweight (250 lb.) yurt which is meant to be taken camping and stuff. But that yurt costs $4000! Being cheap, I decided to make my own. My plan is to use as many salvaged materials as possible, with out sacrificing quality. I will spend money where I have to, but I think I can make the whole thing comfortably under $1000, including all of the tools I have to buy. 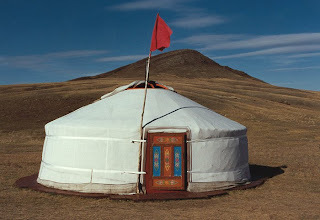 A traditional Mongolian yurt. Hopefully, my yurt will come out looking like this when I'm all finished! I found a guy on craigslist who was giving away a bunch of 2"x2"x12ft pieces of redwood. He took apart a gigantic deck awning, and salvaged the redwood pieces. Most people who do this charge for the wood because it is pretty valuable, even used! Redwood has a lot of tanin compound in it naturally, which gives it a high resistance to rot and resistance to insects. Thats actually why redwood trees live for thousands of years. 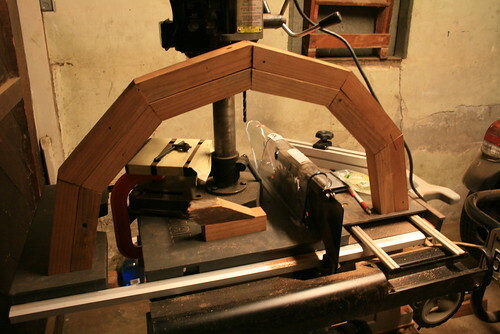 Anyways, I picked up about 20 pieces of the 2"x2"x12ft sections, and I am keeping them to make the roof rafters. Since I have so many, I will also attempt to make the crown of the yurt out of them as well. 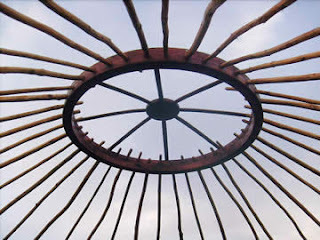 The way a yurt goes together. These are pieces of the crown that I cut out of the 2"x2"s and dowel pinned together. 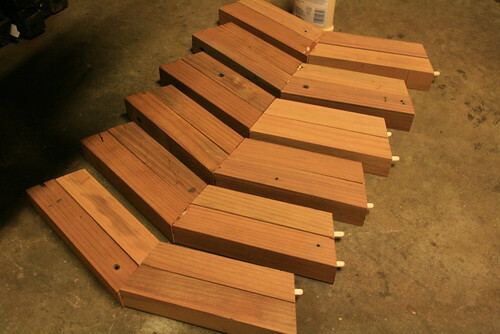 They are drying out after being glued in pairs. After that is dry, I will glue them on fours. This is what half of the main structure of the crown looks like. It isn't glued yet, so its a little rickety. 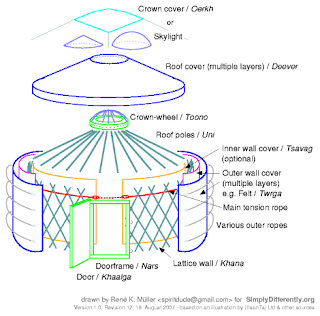 The yurt crown will be 2.5ft in diameter, and it will have cross members across the center, as well as a domed section. It will look something like this, but instead of being circular, it will be a 12-sided polygon, with 36 roof rafters.